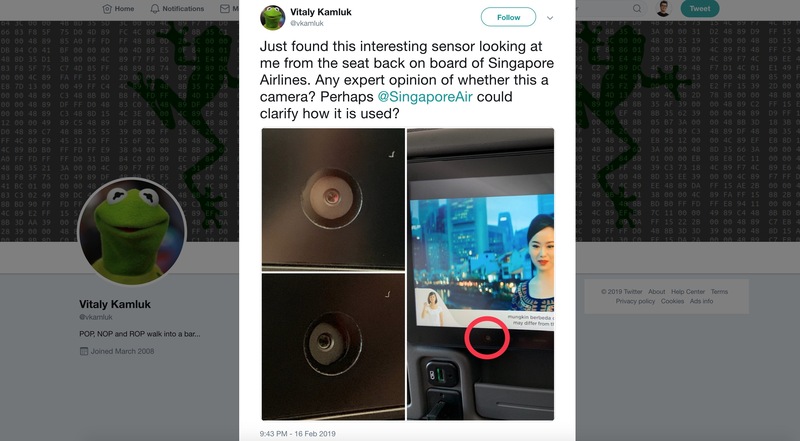 Singapore Airlines says seatback cameras are "disabled"
Hi there, thank you for reaching out to us. We would like to share that some of our newer inflight entertainment systems provided by the original equipment manufacturers do have a camera embedded in the hardware... We have no plans to enable or develop any features using the cameras. Hi Peter, the cameras are in selected Business, Premium Economy and Economy Class. We would like to share that they have been permanently disabled on our aircraft and cannot be activated on board. We have no plans to enable or develop any features using the cameras. Thank you. Hi there, these cameras on our newer IFE systems were provided by the original equipment manufacturers. We have no plans to enable or develop any features using the cameras. It's not a bad idea to cover the camera with post-it note, anyway.